“I do love this series by Donis Casey! Hell With the Lid Blown Off describes the landscape after a tornado hits Boynton, Oklahoma in the summer of 1916. While several people perished due to the tornado it looks like the town bully was murdered before the tornado hit then was blown to a new location. Alafair Tucker and the local lawmen are left with an abundance of suspects in this murder of a highly unpopular man. Even his family members cannot be ruled out as suspects. “Ms. Casey writes more about the people involved than she writes of the mystery. You get swept up in the story of their lives, motivations, and you worry about them. Jubel is mean man. He and his brothers bother a young girl turning into a woman by making suggestive comments to her. When she ignores them and tries to get on with her life, he suggests telling everybody that he’s laid with her and thereby ruining her reputation and any chances for marriage. He blackmails a young man who has a male friend with him while visiting his aunt by saying they have a homosexual relationship. He forced another family to fire their help and send their “slow” boy away by insinuating the son was sleeping with the help. There’s no end of suspects in his killing. 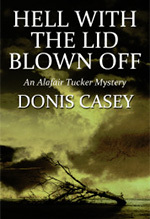 “Hell With the Lid Blown Off is a bit of a departure for author Donis Casey, and it’s one of her very best books in this excellent historical mystery series…The lead-in to the tornado was nerve-wracking, as were the scenes of the tornado itself. With the alternating chapters, I kept getting the feeling that we were saying good-bye to some of these characters, and yes– I was worried. I lived in tornado country, and the scenes depicting the storm brought back some bad memories. Hell With the Lid Blown Off is a fine blend of characterization, mystery, and setting that involves a reader’s mind and emotions. Now that I’ve caught my breath, I can’t wait for my next visit to the Tucker farm.” Cathy Cole, Kittling Books, June 2014. “Alafair Tucker is a no-nonsense amateur sleuth, devoted to her large family in pre-World War I Oklahoma. All the characters are well-drawn and spunky…In the shadow of the coming war, the Tucker family remains as strong and entertaining as ever. And you’ll never complain about housework again after reading what Alafair does in a day.” Roberta Alexander, San Jose Mercury News, June 10,2014. “The continually evolving and growing Tucker family is part of the backbone of Boynton, Oklahoma. Hardworking, generous, loving, and moral…Early twentieth century Oklahoma may well be as foreign to readers under fifty as a setting in another country, but author Doris [sic] Casey does a masterful job of establishing the landscape and making us comfortable with it. The large number of characters, rather than confusing, actually serves to bring a certain reality to the setting. All of us are used to being frequently in places where we know a few people well, many more from shared interests, and most by nodding acquaintance – that’s pretty much how this novel works. And it works well. The mystery and its resolution are challenging and satisfying… a well-grounded and nicely presented series.” Diana Borse, June 2014, Reviewing the Evidence.